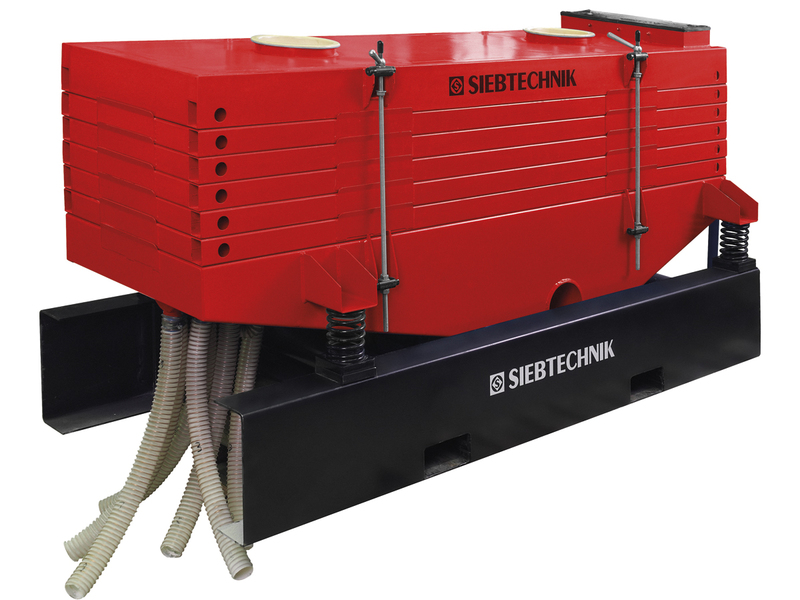 The SIEBTECHNIK multi-deck screening machine is used as a control or classifying screen for free-flowing, dry and/or grainy bulk goods. Thanks to its compact design we achieve a long, reduced-maintenance running time. 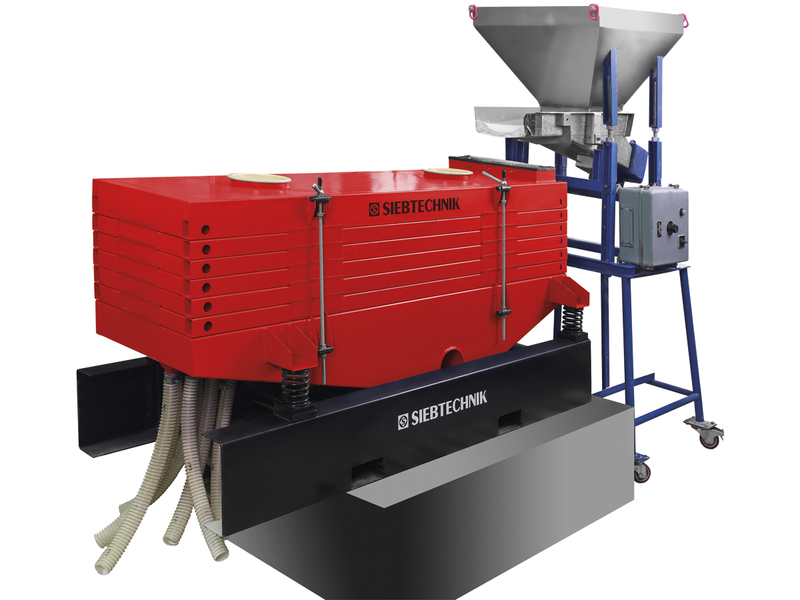 For the pre-separation, enrichment and classification of difficult-to-screen bulk mineral materials. Also with a relatively high near-mesh-sized grain content and critical water content we recommend our multi-deck machines with up to 5 screen decks one above the other. The mostly monogranular screening, made possible by an especially steep screen deck tilt in the lower section, enables high specific screening performances and good classification accuracy, even with small screen holes. Whenever dry material is to be classified as accurately as possible into a number of fractions, the MHR is the screen to use. The large number of nearly vertical throws, the lighter load on the decks and the large screen area enable finished products in analysis screen quality. The test screening machine with a size of 500 x 1400 mm and with up to 7 decks is available at the technical screening centre in Mülheim a.d. Ruhr or as a hire screen for customer tests. The MHR multi-deck screening machine is a screening machine with a linear throwing action and between 2 and 19 separating surfaces for accurate classification of dry bulk materials. Depending on the area of application, throughputs of between 50 kg/h and 50 t/h are possible with separating cuts of between 32 μm and 8 mm. The micro-throwing action of the screened material is generated at a steep throw angle by two unbalance motors. As a result, the material is transported over the screening area on all the decks at the same slow speed. A modular system enables six machine sizes from 0.35 m¬ to 5.6 m¬ per screen deck to be offered. Up to 19 decks can be stacked one above the other and combined to make a number of screen units. The maximum screening area is about 100 m¬. There are 8 easy-to-handle special frames available, which can be changed quickly. Special food-safe beating elements in the screen frames ensure a clog-free screen cloth. This screen was originally developed for use in the grinding medium industry. In the meantime a large number of applications have resulted, e.g. blasting media, quartz sand, glass balls, sugar, salts, powdered metal, powdered rubber, cable waste, fertilisers, SAP, etc. Whenever dry material is to be classified as accurately as possible in a number of fractions, the MHR is the screen to use.